Campbell has some good things going for him, and some bad things. The bad things first. He is the smallest in the family and that means big sis can take advantage of him sometimes. Also, he finds out quite often (because she tells him so) that he isn’t quite as strong, fast, smart, or big as her yet. I keep telling Mara that it won’t last forever, but she isn’t a believer yet. Now, given the hardship, being the youngest does come with some perks. For one, he has big sister to look up to and emulate. Sometimes that means Campbell does some things even faster than Mara did when she was young(er). Campbell has been trying to read for a little while now. As best as we can remember he wanted to start trying at the beginning of the summer. We started him off just the same as Mara did, using Bob Books that we got at Costco. It was a little slow at first, but he got the hang of it. Mom and I were also better at teaching after having gone through some of Mara’s reading camps with her and learning the correct way to work with children on it. Well, as the summer went on, Campbell kept reading a little at a time and going through the books. Mom and I were thinking that he wasn’t doing badly at all (hey, very happy that he even wants to try really), but it “felt” like it was going a little slower for him than Mara. But, still OK. Well, come to find out when doing a little research on Mara’s blog, he happened to get started a year earlier than her!! We had no idea. We were just letting him “pull” for it and do what he wanted. He is really doing great with it and his books. He is through quite a few of them. Now he is getting into the longer words. 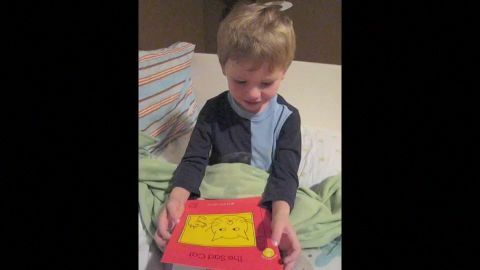 Here is a video of him reading one of the last three letter word books a week ago or so. This is the second or third time reading this book. Campbell, we are so PROUD of you! You did a great job reading your book. You are so smart! You just keep on reading and learning more every day. We hope to stop by to see you and Mara before the middle of December. We send you a great big hug, and you can pass it along to Mara.